Stravaigin Cafe Bar has been a local favourite for more than 20 years, and it's no surprise why. Step inside, and breathe in the vibrant atmosphere, seated by chatty staff and offered one of the most impressive menus on offer anywhere. Ingredients are mainly Scottish; expect salmon, organic chicken, haggis here and there. And specials change on a daily basis. Welcoming in summer with wide open French windows, and cosy in winter with subtle golden lighting, this charming place is always hard to resist. Great news! Finding this page means you can now join our VIP list for Stravaigin Cafe Bar. 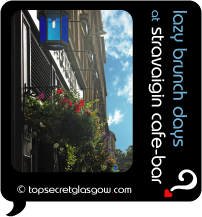 Grab your very own web page all about Stravaigin Cafe Bar. Do you have a special story about Stravaigin Cafe Bar? A funny experience? A grand occasion? A funky photo? A personal tip? A top secret?